I’m slowly working my way through these magazines. This is the April 1958 issue. When they wait like that with desire in their eyes and design in their head, it is the man who meets his Waterloo. A woman’s greatest art is to make a man feel that he has won when he has actually lost. Mala Sinha brings new desire to the screen in “Detective”, a sensational thriller produced by Ranjit Kumar for Amita Chitra. And I haven’t seen Jabeen in anything yet, although that’s about to change! In their bridal poses women are most attractive. They make marriage almost a dream of gods and one wonders why women do not always remain brides—trusting and looking up to the man. Jabeen gives a fine performance in “Hathkadi”, a social theme produced by Dhanwant Shah and directed by S. Bhatia for D. S. Films. One senses that Baburao has been disappointed quite a lot in love! And our favorite CSP girl Shubha Khote—how really beautiful is she??? Eagle Films’ “Mujrim” is another crime pill coated with song, dance and romance. In all likelihood it will be swallowed with pleasure by many picture-goers, but those who approach their entertainment with discrimination should find it sticking in their throats. In spite of all its popular ingredients the picture is too trite and tedious an affair to arouse and sustain audience interest. From the players, Shammi Kapoor as Shankar is once again seen making awkward faces. Having acted in numerous pictures by now, he still seems to be in need of being coached in the alphabet of acting. Ragini as Uma is an eye-filler. But one wishes that she had a smaller nose, a better Hindi diction and that she did more of dancing and less of jumping. Shubha Khote as Shobha looks amateurish as usual. Kamal Kapoor as the police officer is acceptable in spite of the rather long hair on his head. From the rest, S. Banerji as the theatre producer and Johnny Walker as his assistant provide noise while attempting humour. In short, “Mujrim”, as a routine entertainer, contains the usual quota of crime, comedy, music and romance and therefore mass appeal. As a motion picture, it is trite and tiresome. Well, nobody (in this case Baburao) is perfect. Posted on July 18, 2009 at 11:54 am in Baburao Patel's Poisonous Pen, Hindi film history, Hindi movies, Vintage Bollywood images	| RSS feed You can skip to the end and leave a reply. lol at Helen “testing textiles”! Baburao certainly has an active imagination. And though I agree with Baburao’s scathing comment about Ragini’s Hindi diction (it was BAD), I dont think I’ve ever seen her “jump” less than gracefully. I love how he says “Our textiles can now easily take on the Russells and the Mansfields” :-D Hilarious. And while I don’t love Mujrim to pieces, it’s certainly better than he gives it credit for! Yes, it is better than he gives it credit for (especially when it comes to Shammi Kapoor! ), but it still doesn’t make it to my `best of Shammi Kapoor’ list. Partly, I think, because of the screenplay (which could have been better) and partly because of Ragini. I don’t mind her nose, but her diction puts me off. No it isn’t one of my favorites either, although it’s better than the remake with Amitabh from the early 70s (Bandhe Haath). All these movies are described as sensational. Viz “Detective” is a sensational thriller, “Yahudi” is a sensational love story, “Nach Ghar” is a sensational social tale. Of course, the comments about Helen is a classic. Only in his captions though! and yes, his Helen/textile comments shall live forever. I think Jabeen acted in Taj Mahal (Pradeep Kumar and Bina rai ). She was the one expecting to marry the prince but ends up marrying Jeevan. 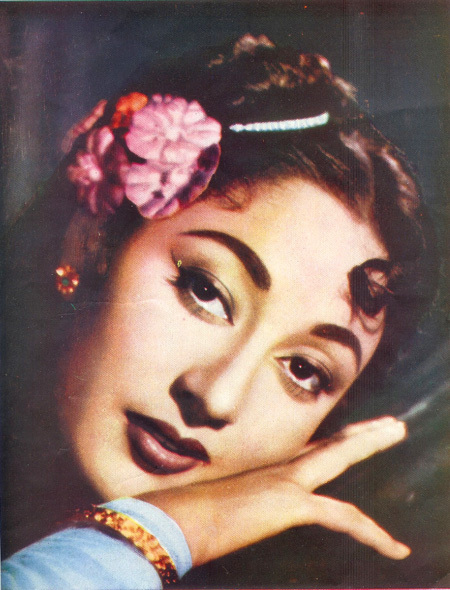 Meena Kumari looks stunning here. She really was so very beautiful in the 1950s. Alcohol really ravaged her looks, poor thing. I should put a before and after photo of her on my wine rack!!!! I think at this point of time Baburao was reserving his vitriol more for the tax guys who were after him. There’s a huge long section in the magazine detailing his persecution at their hands which is pretty funny—he notes every phone call, every bit of mail, everything. I don’t think fairness is what he was after :-D I’m glad she has a staunch defender in you though Richard! Bollyviewer’s constant comments about the so called hindi diction of actresses is also becoming tedious. No one in the hindi film industry comes from a “shudh” hindi speaking background and by that i mean from UP (except a few like AB). You often find punjabi heroes and heroines (who dominate the hindi film industry) having a heavy punjabi accent. Like wise a lot of bengali actors can’t help their bengali slant to hindi – see asit sen and shakti samanta movies – primary example is Suchitra Sen – a fantastic actress. I don’t think the accent matters so much while watching some truly good performances of these actors. Some how it has become a pastime for viewers to be constantly criticising the accents of non hindi speaking actors. To be fair, Bollyviewer was only reacting to Baburao’s criticism of Ragini’s diction (and dustedoff seconded that criticism in her comment above too). My Hindi is so poor as to be unintelligible mostly so I don’t notice all the different accents. But if I were watching an actor speaking English, and his English was so bad that it was hard to understand him or if we were supposed to believe that his character was a native speaker of English it would probably annoy me too. In any case, I wouldn’t know a bad Hindi accent if I was hit over the head by it! Except once: Sylvia Miles in Shalimar speaks abysmal Hindi throughout. It made me cringe, only partially because I fear that it’s what I sound like when I attempt to speak it! As memsaab mentions, I don’t think bollyviewer – or anybody, for that matter – is deliberately criticising non-Hindi speaking actors. And the mere fact that an actor or actress isn’t from the Hindi-speaking belt doesn’t mean that they necessarily have an accent (I can think of dozens who don’t: Vyjyantimala, Ashok Kumar and his siblings, Pradeep Kumar, Danny and Mala Sinha, just to start with). Another point to note is that it’s the diction that we’re talking about, not merely an accent. For example, I’d say Hema Malini had (still does) a fairly pronounced accent, but her diction was fine. The same with Suchitra Sen.
No, not a pastime. Just an observation on what can and cannot add to a viewer’s enjoyment of a film. I love to watch Padmini or Ragini dance, but I wish the dubbing had been done by someone else! That describes Johnny Lever scene I have ever witnessed! LOL! Great poster of Raj Tilak, never heard of this film! A wonderful pic of Shubha Khote! First I thought it is a still from Dekh kabira Roya! I have good memories of that film! Though never really could understand it. I love that photo of Shubha too. I never understood why she was always relegated to the CSP for Mehmood and Dhumal to fight over, poor thing. 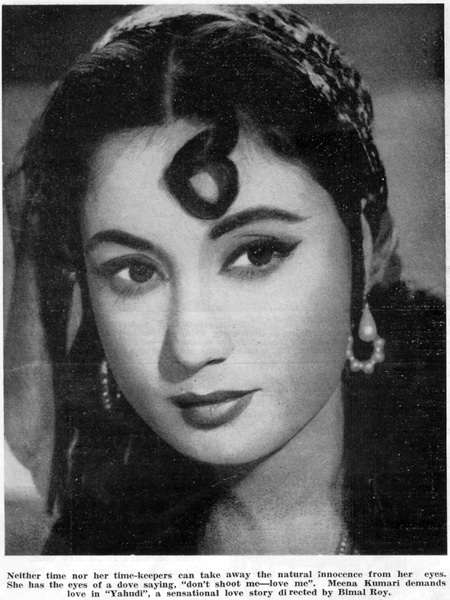 mala sinha looks so beautiful too i dont why some people did not like her. Except for Yahudi and Mujrim, I didnt even know any of these films existed! Kamal Kapoor as the police officer is acceptable in spite of the rather long hair on his head. — makes me wonder if he had a rat tail. Fashion forward! I wonder what Baburao would have made of the 80s. My god, what if he’d reviewed a Mithun movie? Delicious! Regarding this constant complaint about the Hindi diction of Padmini and Ragini… I suspect that Anonymous is also responding to another conversation that appeared on Bollyviewer’s site, and possibly several places where Dustedoff made the same complaint. Though both Bollyviewer and Dustedoff have also said very nice things about both actresses – at least with regard to dancing skills – I have to say that I am also getting a little weary of this constant harping on supposed problems in the two Travancore Sisters’ Hindi diction. Of course, I wouldn’t know bad Hindi diction if it hit me over the head, either. But if the problem here is the accent… For one thing, I do believe there were a number of times when people loved actresses and actors in Hollywood films for their accents. And, more importantly, both Padmini and Ragini were acting in a number of different languages. I have seen films or clips of both of them speaking in Tamil and Malayalam (of course) as well as Hindi, and I have seen clips of Padmini acting in Telugu. I would think that instead of harping on Padmini’s or Ragini’s imperfect diction in one language, Hindi, people would be more inclined to admire these Kerala-born actresses for their linguistic knowledge. In real life, I always take different Hindi accents to mean that the speaker knows and speaks more languages than I do! In films though, its different. Accent and diction form a very important part of acting skills. For example, how convincing would “Bridget Jones” be as a Brit singleton had Renee Zelwegger chosen to play her character with an American accent? Hugh Laurie had to don an American accent to play House. Older Hollywood wasnt quite that good with accents – Robert Taylor played an American accented Ivanhoe and Lancelot (Knights Of The Round Table) which didnt bother me when I first saw the film because I couldnt distinguish between those accents then, now I can, and it does! As anonymous above points out, Hindi films were dominated by Punjabi actors, but very few of them spoke with any trace of accents (the Kapoors and Anands, Vinod Khanna, Rajesh Khanna, etc, all spoke unaccented Hindi). Balraj Sahni talked in his biography about struggling to remove signs of his Punjabi accent. I forget about Vyjayanthimala and Waheeda Rehman being South Indians because their Hindi onscreen was flawless. Its only when I saw their interviews that I realised that their spoken Hindi was not like that! If they could take such pains for acting, why couldnt Padmini (and Ragini) whose “linguistic ability made her a very significant figure in the history of 20th-century moviemaking in India”? And I am sorry if my criticism of your favorite is so annoying, but we do all have a right to differ, AND express our views, surely? As for whether we all have a right to differ and express our views, of course we do! You have a right to complain about Ragini or Padmini’s diction, and others among us have the right to say that it annoys us. :) I don’t recall anyone saying that your comments should be banned! QuThanks Richard, I am glad there is somebody who appreciates my PoV. Question to Bollyviewer – how come the accents of Padmini and Ragini annoy and not the very bengali slang to hindi spoken by talented actors like Suchitra Sen and Uttam Kumar etc? The examples you have given of punjabi actors having good accents – kapoors have been based in Bombay for ages since Prithiviraj Kapoor migrated to India from Lahore. Vinod Khanna too was raised in Bombay. Rajesh Khanna is supposed to be from Delhi but again was raised in Bombay. Are we really speaking of punjabis originally from punjab like Dharm Paji? Richard is right about the talent of people lilke Padmini and Ragini. who originally from Kerala, have been dubbing their movies themselves in tamil, telugu and hindi etc. Bollyviewer, if you start counting the number of Indian actors who can truly dub their dialogues in the original language of the film then you will be hard pressed to find many in the hindi film industry. A number of punjbai actors are very popular in South Indian movies these days. Most of their dialogues are dubbed. Those who make an attempt, their diction and accent is absymal. Yet audiences flock to see their movies. T To name a few popular punjabi actresses down South – Simran, Jyotika, Bhoomika Chawla, Tamanna Bhatia, Sonia Aggarwal. Even Khusboo who began her career as a child actor in hindi movies was very popular in tamil films in the 80s and 90s. Katrina Kaif who is so popular in hindi movies began her career in a hit telugu movie “Malleswari” – not knowing a word of either hindi or telugu. Obviously Katrina’s dialogues were dubbed. My apologies for some typos (addl words) and spellos. For some reason the left side of the comments box is not visible on my screen, hence the double words. Reg typo, it should be “abysmal” – i think there was a typo originally. I don’t understand…is that supposed to be a problem? It’s an interesting debate! I wish I had more to contribute, but I can’t tell a good Hindi accent from a bad one, although melodious diction is another thing altogether—and I think Rajesh Khanna rules on that score! Well, there are lots of accents, which one doesn’t like. But that doesn’t mean one doesn’t like the acting of the person or the language from which the accent arises. If somebody doesn’t like the accent of an actor or actress, it is his or her taste. One can hardly blame him or her for that. I hardly think Dustedoff meant that Ragini should correct her accent or learn better Hindi or worse still generalise it. The reason I get irritated with diction that isn’t suited to the character is that it detracts from the believability of the character. To have a person, supposedly North Indian, speak in an obvious regional accent is distracting and hard to believe, at least for me. So I’m fine with Suchitra Sen’s Bengali accent in Devdas, but it does irk me a bit in a film like Bambai ka Babu or Sarhad, where she’s obviously not Bengali. Incidentally, with reference to Sunil’s remark about Lata: I recall reading somewhere that Dilip Kumar had said (when Lata hadn’t yet established herself), “Is she Maharashtrian? You can smell the rice-and-dal in their singing” – or words to that effect, more or less saying that being a Maharashtrian and not knowing Urdu, she couldn’t sing convincingly in Urdu. Lata was naturally hurt, but learnt Urdu subsequently. Dara Singh can be thought of as the Arnie of India. I haven’t watched but can imagine the Punjabi (/”Austrian”) Alexander the Great of Sikandar-E-Azam (1965)! But I do agree with Richard that indeed many actors/actresses can be likable purely because of their “flaws”. I had been particularly fond of Priya Rajvansh, for the very reasons most critics disliked her. The most grating for me is Leela Mishra, with her UP accent, playing an anglo Indian lady in “Baaton Baaton Mein”. And to get back to Baburao, wonder what he would’ve said about apna Kaka :-) Are there any anecdotal gems for us to savor or fume over on that score Greta? Interesting discussion about diction and accents. I think it depends on the scene. If it is a scene that requires “purity” for credibility, then an incongruous accent can be scene-damaging. For example, if it is a Muslim social based in Lucknow and you have a South Indian accent…. But other than that, if it is just a routine role, it is just something you take in your stride, I guess. Hema and Sridevi may not have the perfect Hindi accents (far from it) but they make up for this with their screen presence. Otherwise they would not have become such big stars, inspite of having this accent problem. Oh and sorry to hog your comments space but this deal about an actor being dubbed is a huge NO NO for me personally. Acting is as much about voice delivery as it is visual emoting. Which is why I’d much rather watch subtitled foreign films rather than dubbed ones. For instance, an already bad film “Bhola Bhala” (such a pity because it was so good in parts) was made infinitely worse because they dubbed Rajesh Khanna (can you imagine???) in his daku avatar with Kader Khan’s voice. It was unreal to say the least…. I hate dubbed films too, would much rather read subtitles. when you walk into a movie set in one specific language, it’s a disorienting experience to hear something that doesn’t seem to fit. In some movies this doesn’t matter – like Memsaab’s example of an Arnold movie, if someone starts lisping in Golmaal Returns, it’s a lot less apparent than if someone pulls the same act in Omkara. For eg, Marion Cotillard has a charming accent, but it sticks out like a sore thumb in Public Enemies. As far as Anonymous’ examples of actresses down South who can’t speak the language and yet act in successful movies – I don’t understand the point. I’m a South Indian and I’ve yet to meet a single South Indian who thinks this is a good thing, however popular the movies might be or how “hot” the actresses. I dont think BV or anybody else thinks Padmini can’t act. Memsaab – Rajtilak must be an interesting watch for some good dances since both Padmini and Vyjanthi are in the movie. BTW, the Ganesh the poster is referring to is Gemini Ganeshan – Rekha’s real life dad. I’ve only seen him in Miss Mary, but would love to see Vyjayanthimala and Padmini in a dance-off! 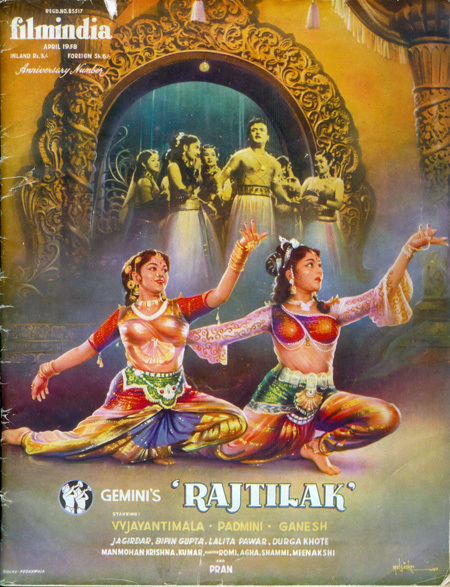 Raj Tilak is the Hindi remake of Gemini’s Tamil blockbuster “Vanjikottai Valiban.” Both versions of the movie are famous for the awesome classical dance-off between Padmini and Vyjanthimala. Thanks for this wonderful contribution! and thanks also for the wonderful songs you put up on you tube! have found many pancham gems at your you tube site! And I have watched the competition separately many times since. Yes, it is truly awesome… And it’s the only dance competition I have seen with Vyjayanthimala that Vyjayanthimala lost. Well, I’m just going to have to disagree with you, as I have done with Mister Naidu… I think Vyjayanthimala definitely won that one! YouI should perhaps try to get a copy of the tamil original for the dance competition! Is this movie available on DVD? And doesn’t the “ever-charming” Helen look beautiful in that photo from Filmindia! Even Mr. Patel couldn’t f find anything mean to say about her Although, I must say that I generally look forward to his vitriolic observations about others. :-) Thanks for posting all this wonderful and rare stuff from the magazine. Love It! I must see the moviie where that Helen still comes from, but it appears that “Naach Ghar” is another one of those missing films on DVD. (: Now, Rajtilak has also been added to the list along with Raat Ke Rahi, Daku. Pagla Kahin Ka, Trip to Moon, Wahan Ke Log, Ek Nanhi Munni Ladki, Fearless Nadia et caetera, et caetera, et caetera! Btw, I thought you might like to know that another Shammi film with Helen has just been released on DVD- Sachchai (1969) ! It has a great soundtrack from Shankar-Jaikishan with the Helen in a bottle dance song and the fantastic Shammi rock and roll and sitars song with Sanjeev Kumar. Also in the movie is the memorable love song with Sadhana – “Sau Baras Ki Zindagi Se Achchhe Hain!” Anxiously waiting for my copy to arrive! Yep, Induna rules. Been buying from the owner on Ebay before he started the company. Nice guy. I have all those films on VCD except for Nadia. Must remedy that in next order. :) Hopefully these films will make it to the DVD market someday. Hope they don’t run out of their Sachchai stock for others who may want it! Just by the way: though it has a great cast and excellent music, don’t expect too much from Sachchai. I rented it, saw it and so didn’t like it that I didn’t even bother to write a review for it. As far as I know they are totally legal! I assume these manufacturers (Eagle, KMI, Friends, etc.) have gotten permission from the producers/studios/filmmakers who own the rights. Induna only sells legitimate disks. i just received my copy of Sachchai and the quality is abysmal. Its one of the of worst Indian DVDs that I own and that’s saying something! Appears that the source used is from a poor quality VHS tape. Even the disc label is off center. Some of the clips from Sachchai on Youtube are 10 times better than this! Ugh! Miss coca Cola coming out in VCD? Seriously?! That’s AWESOME. 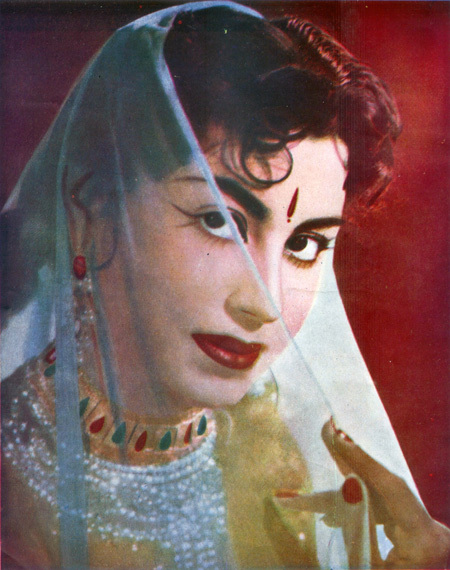 Shammi and Geeta in starring roles opposite each other, and Helen and OPN’s music…Oh my! And singing by Geeta Dutt! Definitely worth waiting for! Released in 1955. It may be the earliest film of Helen available. She was 16. Thanks for the link, she’s so baby-faced but still gorgeous in this song. Ooh, I think you’re right about Alif Laila…she sings the song. Here’s the You Tube link. 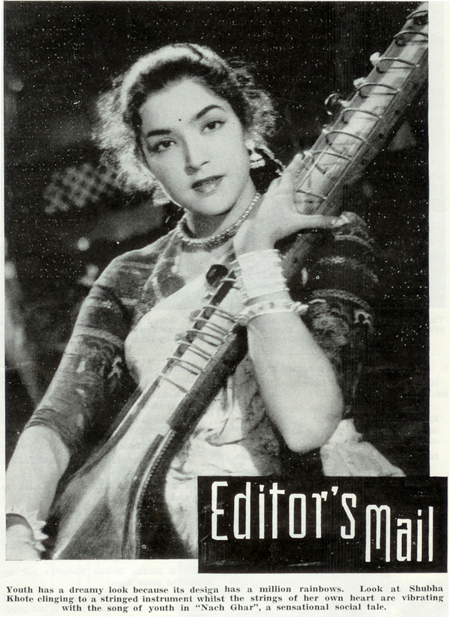 I don’t recall her in the Awara song…wouldn’t she have been awfully young in 1951? Thanks Shalini for those 2 clips. Nice. Love Mayur Pankh with close-ups of Helen in color and in decent quality. I don’t believe either of those movies have made it to DVD. :( In Awara I can’t make out which one is her in the chorus. “Is she Maharashtrian? You can smell the rice-and-dal in their singing” – or words to that effect, more or less saying that being a Maharashtrian and not knowing Urdu, she couldn’t sing convincingly in Urdu. So what was the problem – that she didn’t speak Urdu or that her accent was Maharashtrian? I have Urdu First Language friends from Poona, so they would be Maharashtrian Urdu speakers. So too was Ismail Merchant, born in Bombay (as it was then) and a passionate advocate, sponsor and promoter of Urdu language and culture (curiously enough he also looked enough like my late Uncle to fool my father). Surely Dilip wasn’t saying that all Maharashtrians are incapable of speaking Urdu? Memsaab, I have looking everywhere for Filmindia issues. Where did you get them? Would love to now :-). They come up on eBay now and then (but are expensive). I am dying to go to the Film Archive in Pune and have a look through them there, I guess they have every issue.